A French experiment Sigma on the Russian satellite Granat and the Dutch Wide Field Camera (WFC) on the Italian BeppoSAX satellite were pinhole cameras that imaged the x-ray sky at photon energies of 2-30 keV. Since many of these sources are variable in intensity, successive exposures permitted the intensities to be monitored on extended time scales. A reconstructed image of the galactic center region from the WFC is shown in Fig. 4. Although such systems can yield sky maps including a number of discrete sources, they do not provide true imaging. Unlike focusing systems, the signal from a given point source illuminates the entire counter and hence must contend with the background from the entire detector as well as with the flux from all the other sources in the field of view. These both contribute to the background noise. Such systems generally yield angular resolutions down to a few arcminutes whereas focusing systems yield resolutions of <1" in the optical and x ray. Most radio astronomy is ground based, e.g., the new (in 2000) steerable-dish 100-m diameter Byrd Green Bank Telescope in West Virginia, the huge (300-m) fixed antenna dish in Arecibo, Puerto Rico, and the cooperative world-wide collection of diverse telescopes that work in concert to obtain extremely high angular resolutions, called very long baseline interferometry (VLBI; Section 7.4). Radio astronomy from space can extend our knowledge of the radio sky to frequencies below the ionospheric cutoff at ~10 MHz. Ideally this would be carried out with telescopes on the far side of the moon to eliminate radio noise from the earth. Observations from orbiting satellites can improve the angular precision of VLBI measurements. The Japanese HALCA satellite, launched in 1997, carried out VLBI in conjunction with ground-based telescopes, and a successor mission is being planned. At microwave frequencies, the Cosmic Background Explorer (COBE) satellite (1989-93) studied the residual radiation from the hot early universe and established with greatly increased confidence that it did in fact originate in the early universe. It also found tiny fluctuations in its brightness that are most likely the origins of galaxy formation. Recent followup studies of these fluctuations with, for example, the Wilkinson Microwave Anisotropy Probe (WMAP, 2001) yield improved values for parameters that describe the universe, such as the Hubble constant. The Submillimeter Wave Astronomy Satellite (SWAS, 1998) studies star formation; it maps the location of spectral lines from molecules such as H2O and O2 in giant molecular clouds and dark cloud cores at frequencies near 500 GHz. The Submillimeter Array is an array of eight 6-m telescopes being built on Mauna Kea in Hawaii that will reach to 900 GHz with angular resolutions as fine as 0.1". In the infrared, the ground-based all-sky survey at wavelength 2 |m (2MASS) has greatly expanded our knowledge of the IR sky. The orbiting Infrared Astronomical Satellite (IRAS, 1983) had previously surveyed the sky at 12, 25, 60, and 100 |m, and studies of these sources were the objective of the European Infrared Space Observatory (ISO, 1995-1998). Infrared radiation passes through interstellar clouds of gas and dust much more easily than does optical radiation. Thus IR astronomers can peer into dusty regions where stars are currently being formed. A major infrared satellite mission is the Space Infrared Telescope Facility (SIRTF, scheduled for 2003). Hubble Space Telescope (HST, 1990), being above the atmosphere, provides resolution of about 0.05". The more finely focused images enable it to detect fainter and more distant objects than heretofore possible. Speckle interferometry and adaptive optics are new techniques coming into use to overcome the atmospheric blurring for ground-based telescopes, at least for some observations (see below). The use of multiple telescopes at one site enables optical astronomers to use optical inter-ferometry to greatly improve angular resolutions (Section 7.4), at least for bright sources. The orbiting International Ultraviolet Explorer (IUE, 1978) was sensitive over the range 3.8-10.8 eV (320-115 nm). The HST, although primarily an optical telescope, is sensitive from the near-IR up into the UV band: E = 1.1-10.8 eV (X = 1100-115 nm). The important Lyman-alpha transition of hydrogen at 10.2 eV (see Fig. 10.1) is accessible to the HST. Spectroscopy in the far UV is being carried out by the Far Ultraviolet Spectroscopic Explorer (FUSE, 1999, 10.3-13.8 eV, 120-90 nm) which studies the spectral lines of atoms in the diffuse gases of the interstellar medium, supernova remnants, and other galaxies. At higher photon energies, beyond the 13.6 ionization energy of hydrogen which makes the ISM quite opaque, the Extreme Ultraviolet Explorer (EUVE, 1992-2000) studied nearby isolated hot white dwarfs, white dwarfs in accreting binary systems (cataclysmic variables), and the local hot interstellar medium itself. The Uhuru satellite (1970) was the first orbiting satellite dedicated solely to celestial x-ray astronomy; it demonstrated the existence of neutron stars in binary stellar systems. It was followed by a succession of primarily US, European, and Japanese satellite missions that extended the field into a major branch of astronomy with imaging, spectroscopic, and timing capabilities. Current or recent missions include the German Roentgen satellite ROSAT (1990), the Japanese ASCA (1993), the US Rossi X-ray Timing Explorer (1995), and the Italian and Dutch BeppoSAX (1996). More recently launched (1999) are the powerful US Chandra and the European XMM-Newton observatories. They are large x-ray telescopes with reflective optics that focus x rays, yielding images and spectroscopy of distant objects with unprecedented sensitivity. Gamma-ray astronomy has been carried out from space with a series of satellites leading up to the recent Compton Gamma-Ray Observatory (CGRO) which studied gamma-ray bursts (GRB) extensively. The recently launched Integral and the forthcoming SWIFT and GLAST missions will carry on the field. A major breakthrough in gamma-ray astronomy has been the determination that the explosive GRB take place in distant galaxies and hence are the most energetic explosions known, except for the Big Bang origin of the universe. At energies beyond about 1012 eV, the field is called TeV astronomy or VHE (Very High Energy) astronomy. The fluxes of such energetic gamma rays are so low that detections by a satellite would be rare. However, the gamma rays of these energies develop in the atmosphere into a cascade of electrons and lower energy gamma rays, known as an extensive air shower (EAS; Section 12.3). 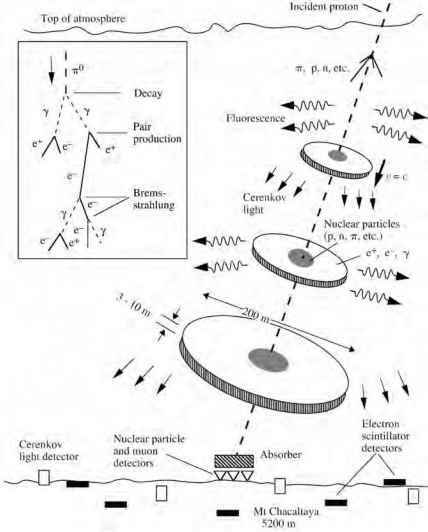 The electrons emit light in the atmosphere (Cerenkov light; Section 12.2) that can be seen from ground level with big crudely-focusing (by optical-astronomy standards) light-collecting telescopes. Some dozen sources have been detected, primarily galactic pulsars, supernova remnants and jets in extragalactic blazars (the nuclei of very active galaxies). This astronomy has been carried out with ground-based telescopes, e.g., in Arizona and the Canary Islands at the Whipple and HEGRA observatories, respectively. Although the number of detected sources is few and the angular resolution modest, the processes studied are among the most energetic in astronomy. New more powerful facilities coming on line over the next few years are HESS (European), CANGAROO III (Australian), and VERITAS (US). Gamma-ray astronomy above ~ 1014 eV is carried out through detections of electrons in the gamma-ray initiated EAS that reach ground level. To date, no verified signals from point sources have been detected in this energy range. The high background due to EAS initiated by the more numerous incident protons mitigates against such detections.